In November, Tom Filipowicz visited the event held for the Mochica Identity Week and discusses what he feels is a strong local connection and respect for traditions and customs. 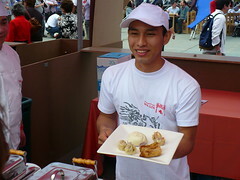 Participating were school groups, each choosing and important local custom to present to visitors. If you were to ask me what I like most about Peru I would probably talk for hours, but ultimately my answer would narrow down to the people. One of the characteristics I admire most about them is their appreciation and respect for their history. 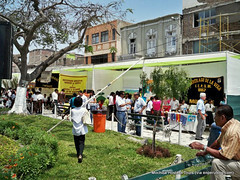 Cultural celebrations are common throughout the country, much like the one being held this week in Chiclayo’s Plazuela Elias Aguirre park. 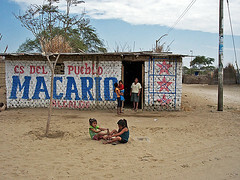 “Semana de la Identidad Muchik 2009” (Mochica Identity Week) marks the seventh anniversary of the Lambayeque Region. 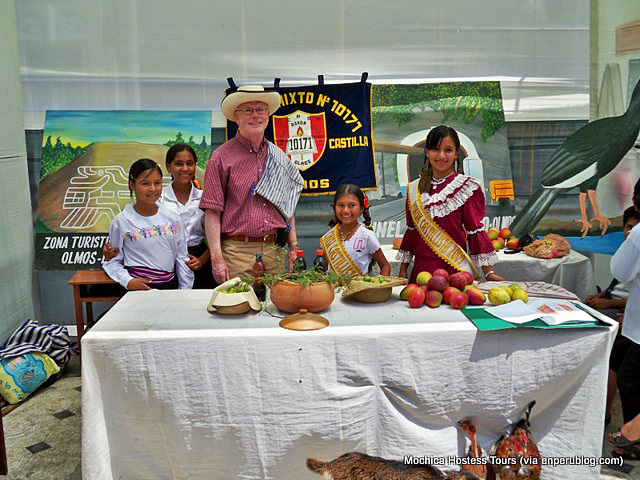 It is a week-long activity which includes a beauty contest for the title of Miss Lambayeque Region; school presentations featuring displays of various area traditions exhibited by the students under the direction of a faculty advisor, and a photo exhibition of the Region. Awards are given for the best school presentations and photos. I regret that space allows me to focus on only three of the school presentations we saw today, because all of the participating schools did an excellent job of conveying information about the tradition they chose to exhibit. The school I.E.P. Thor Heyerdahl representing the Túcume district chose a theme of shamanism or faith healing. 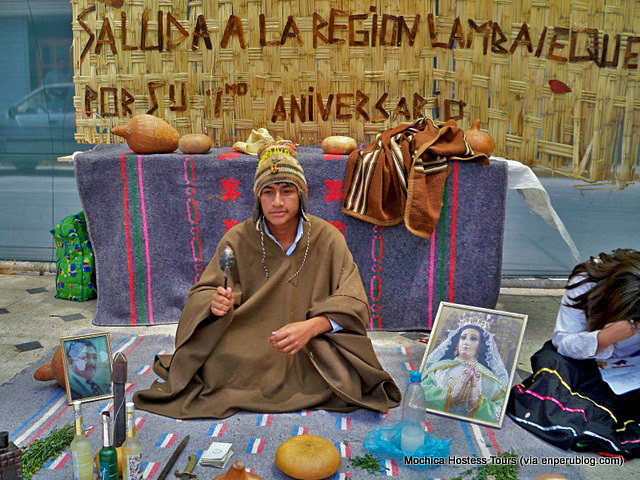 The young man acting the part of the shaman was very convincing as he performed various rituals. I had done some reading on this subject and also have had discussions with Maribel and others so can attest to the accuracy of what this young man was doing. I should also mention that shamanism is not a dead tradition. 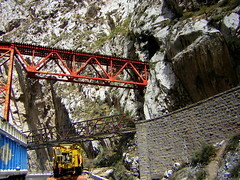 It is practiced widely in Peru and particularly in the northern region. 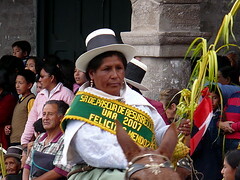 As an example, when I was encouraged to take part in a cleansing ceremony which lasted about five minutes, the large crowd that had gathered was obviously amused that a gringo was involved in the ritual but their faces also reflected a serious respect for the process they were watching. 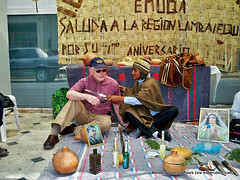 The man in the photo in front of me is Santos Vera; the most famous shaman in the Lambayeque Region. He died many years ago but is still revered by believers. He is reputed to have had discussions with the devil. 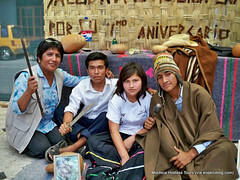 Even though I am not yet Peruvian, I am grateful for people like Professora Luisa Rosa Sosa Llùncor (pictured on the left) who not only take the time to organize and participate in activities like this, but through their efforts ensure that the rich cultural traditions of Peru remain vibrant. School I.E. No. 10171 Mariscal Ramòn Castilla from Olmos featured traditional agricultural crops such as Limòn, mangos and maracuya, which is the fruit from the maracuya tree and is used to make juice and jelly. Algarrobina is a syrup made from the fruit of the algarrobo tree. The syrup is very thick and dark brown in color. To me it has a nutty, smoky taste to it. It is not sweet. 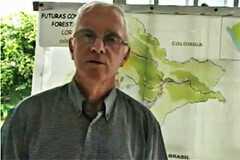 The advisor to these students is Professor Rolando Chambergo. He invited us to visit the school and we intend at accept his invitation in the near future. I.E.P.S.M No. 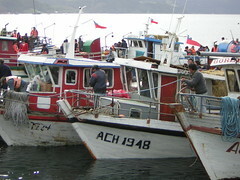 10157 Inca Garcilaso de la Vega is a school from Morrope. 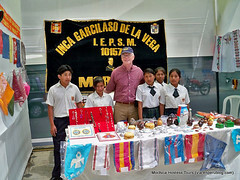 The students displayed traditional handicrafts including chicha de jora, which is an ancient beverage made from shucked yellow corn after it has germinated and sprouted roots. It is then boiled in water and allowed to ferment for seven days. I purchased one of the small gourds displayed on the table which is called a ‘poto’ and used it to sample the beverage. The flavor is hard to describe, other than to say it tastes like corn. I didn’t learn anything about this school but could not resist posting the photo of these kids. The traditional products on display are hand painted gourds and ornamental leather products. 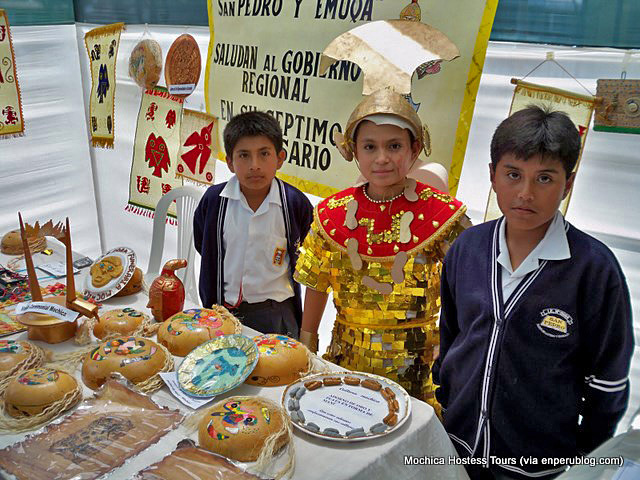 Identity week continues Monday with a photo exposition of the Lambayeque Region in the regional government auditorium. We’ll be there. We wish you could be there to enjoy it with us. Viva Peru!